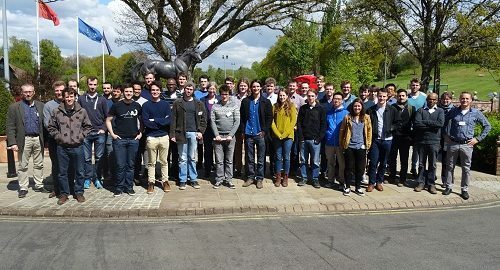 The Quantum Technologies School took place on 24-26 April 2017 at Old Thorns, Liphook in Hampshire. Over 50 delegates attended the residential school led by senior researchers in the SEPnet region. PGRs were exposed to applications of physics which directly rely on the properties of quantum mechanics to perform a function beyond current technological capability. A total of six sessions spanned different directions in which quantum technology is progressing: Quantum computation, Quantum simulation, Quantum sensing / metrology and Quantum communications. 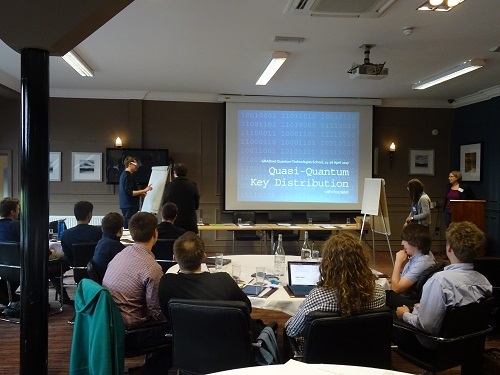 A PGR delegate gave positive feedback saying “the different areas of quantum technology were touched in the right balance. This makes the conference quite interesting. A great use and worth of my time. A great impact into my life and a wonderful exposure for a newbie in the world of quantum technology”. Thank you to all the speakers: Erika Andersson, Heriot-Watt University, Sougato Bose, University College London; Christopher Chunnilall, NPL; Andreas Freise, University of Birmingham, Eran Ginossar, University of Surrey, Jaewoo Joo, University of Surrey, Stefan Kuhr, University of Strathclyde, John Morton, University College London; Yuri Ovchinnikov, NPL​, Diego Porras, University of Sussex, Alessandro Rossi, University of Cambridge​, Tim Spiller, University of York, Seb Weidt, University of Sussex and Jonathan Williams, NPL. Quantum crypto with chocolate activity! Joint first place: Corin Gawith and Oliver Trojack, University of Southampton. Joint second place: Rhonda Au Yeung, University of Surrey and Teresa Hönigl-Decrinis, Royal Holloway, University of London. 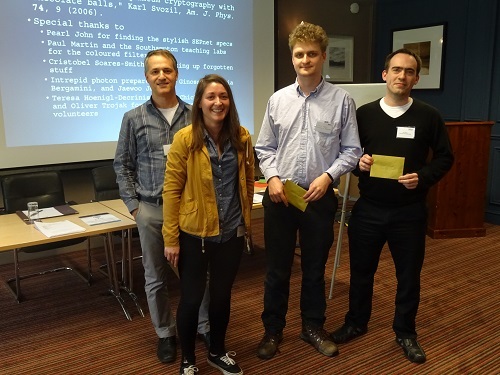 (L-R) Dr Eran Ginossar, Teresa Hönigl-Decrinis, Oliver Trojack and Sam Berry receiving the prize on behalf of Corin Gawith. Designed to help new PhD students embarking on their research, the presentation style of the courses is very varied. Clean code is about creating organised, readable and terse programming code and is delivered as an online presentation. The Virtual Observatory Tools is a video which will show you how to use the Virtual Observatory (VO) tools: Aladin, Simbad, Vizier, and Topcat. Note: you will need to sign on to the GRADnet VRE to access these modules. If you are having problems logging on you can find help here. 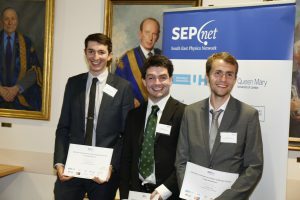 At the end of March, SEPnet/National Physical Laboratory PhD students, Alex Browning (Surrey) and Héctor Corte-León (Royal Holloway), organised a conference at Southampton University with the help of the SEPnet Graduate Network (GRADnet). The conference on Functional Scanning Probe Microscopy Techniques brought together PhD students from the nine SEPnet universities to promote interaction with senior researchers in the field of scanning probe microscopy. With almost a year of planning, this conference represents one of a series which focusses on giving students (Alex and Héctor in this case) an opportunity to develop their professional skills by contacting speakers, advertising the conference and coordinating the timetable for the different talks and poster sessions. The main areas covered at this year’s conference included biotechnology applications (e.g. study of cell’s membrane stiffness); in-situ magnetic force microscopy (application of magnetic fields during the imaging process) and functionalized probes and the interaction with the sample’s surface (e.g. by attaching proteins to the apex of the probe). Delegates gave positive feedback about the conference and welcomed the opportunity to present talks to their peers and senior researchers and to network with other institutions. 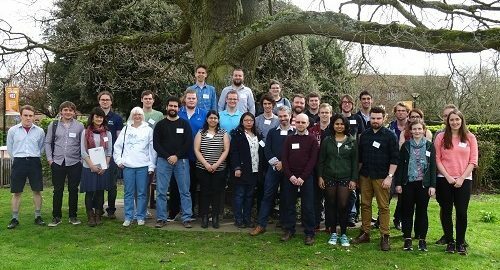 On the 30th-31st March 2017 the University of Southampton hosted two student-led conferences funded by SEPnet – the South East Physics Network. The astronomy-themed conference led by Peter Boorman, Christopher Frohmaier and Bella Boulderstone, all PhD students at Southampton, was entitled ‘A Broadband Look into Astrophysical Process’. The primary aim was to expose all attendees to as many different areas in modern astrophysical research as possible. It has now become commonplace for new PhD students to start work in a particular area or wavelength of astronomy without the wider context of how their research will fit into the complete picture. For this reason, the Scientific Organising Committee wanted to give all attendees an idea of modern day research in all areas of astronomy – not just their own. 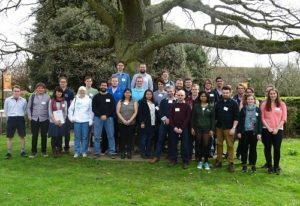 The 43 registered attendees included PhD students, post-doctoral researchers and invited speakers from almost 15 different institutions throughout the UK. The conference programme included 7 invited review talks on major areas in astronomy, including: radio; infrared; optical; ultraviolet; X-ray; gamma ray and cosmology/big data. There were additionally 14 student-contributed oral presentations and 13 poster presentations, all on a multitude of astrophysical research topics. All poster presenters were also given the chance to present the key findings of their work in a 1-minute ‘flash presentation’, in which they were given a minute to present a single slide to the audience.